01.) The Clipse - "We Got It For Cheap" - An easy choice to start off with one of my favorite intro tracks of all time. This hard-hitting gem comes off the 2006 classic, Hell Hath No Fury. 02.) M.O.P. - "Ante Up Remix" (feat. Busta Rhymes, Teflon & Remy Ma) - I've been trying to fit this song into a tape for some time now, but just haven't found the right songs to put around it. Remy Ma outshines everyone on the star-studded collaboration. 03.) The Roots - "Doin' It Again" - One of the best songs off the best album of 2010. 04.) De La Soul - "Rock Co.Kane Flow" (feat. MF Doom) - Another track I've been trying to fit in for a while. The hard hitting Jake One instrumental is perhaps my favorite of all time. 05.) The Left - "Chokehold" (feat. Paradime) - My personal favorite off my favorite debut album of the year. I have a feeling we'll be hearing bit things about this group for years to come. 06.) The Knux - "Watchu Say" - An undeniably fun track off the best EP of 2010. 07.) Drake & Saukrates - "The Search" - The Canadian emcees combine for one of the few songs on which I respect Drizzy. 08.) XV - "Fall Out The Sky" - Hopefully 2011 XV is more akin to 2009 XV than 2010 XV. 09.) Chiddy Bang - "All Things Go" - Expect big things from 2011's Swelly Express. 10.) Slaughterhouse - "Onlslaught 2" - One of the collective's better collabs. And for them wack songs that you made/ I want you to throw your pen (pin), but hold the grenade. 11.) Dyme Def - "Fresh2Def" - There's no denying that Space Music sound. I've been trying to find a spot to fit this song and it ended up working perfectly between Slaughterhouse and Lupe. 12.) Lupe Fiasco - "The Instrumental" (feat. Jonah Matranga) - Only Lupe could make a song protesting the power of commercialism and television sound cool. 13.) Blue Scholars - "Loyalty" - I'll still occassionally get shivers listening to this gem of Bayani. Cinematropolis is dropping soon. 14.) Hi-Tek, Ghostface Killah, Pretty Ugly, & The Willie Cottrell Band - "Josephine" - This was a late addition to the tape and completely altered the sound of the second half. One of the better songs off a under appreciated album. 15.) Dilated Peoples - "This Way" (feat. Kanye West) - One of Kanye's best verses from before the fame went to his head. 16.) Laws - "Target Practice" (feat. Joe Budden) - The hook and instrumental on this song are to die for. The verses aren't too shabby in their own right. 17.) Eminem - "I'm Back" - I haven't put nearly enough Em onto previous tapes, but this Slim Shady-centered song was too tempting to resist. Absolutely insane lyrics and rhyme scheme. 18.) Atmosphere - "Smart Went Crazy" - I needed a way to transition from Marshall Mathers into some of the lighter, ending tracks. Slug and Ant's track off You Can't Imagine How Much Fun We're Having, worked out perfectly. 19.) Zion I - "Temperature" (feat. Talib Kweli) - One of the best tracks from one of the genre's best albums of all time. I still can't believe it when people tell me they haven't heard True & Livin'. 20.) Macklemore & Ryan Lewis - "Otherside (Remix)" (feat. Fences) - I still haven't decided if I like the original Chili Peppers version more. Seattle-based Fences adds a haunting chorus to this rendition. 21.) Killah Priest - "B.I.B.L.E. 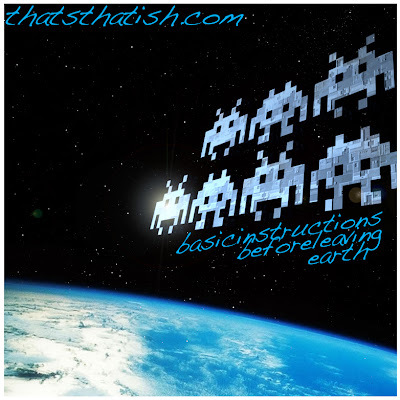 (Basic Instructions Before Leaving Earth)" - Nothing more needs to be said about this song. Just listen. 22.) Jake One - "R.I.P." - I'm trying to add in at least one instrumental per tape. This doesn't quite quality, but I thought fit in really well after the previous two tracks. 23.) Jay-Z - "American Gangster" - The perfect "hero rides off into the sunset"-track to end the tape.